Introducing the Frenchest salad we know. It won us over quickly because it just so happens to be gorgeous (très chic) and it’s packed with hearty, flavorful toppings (lettuce who?). Parisians top theirs with canned tuna, but we decided to bulk up our veggie Niçoise salad with loads of colorful veggies. 1. Make the Dressing: In a small bowl, whisk together the shallots, garlic, mustard and vinegar. Gradually whisk in the oil until the mixture is thick. Season with salt and pepper. 2. ﻿Make the Salad: In a large pot, cover the potatoes with 1 inch of water and bring to a boil. Cook until the potatoes are fork-tender, 8 to 10 minutes. Drain and cool slightly. 3. Meanwhile, in a medium bowl, whisk together the vinegar, olive oil and curry paste. Add the green beans and toss well to coat. Season with salt and pepper. 4. 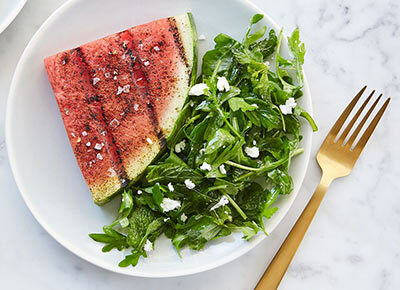 In a large bowl, toss the arugula with half of the dressing and then transfer to a large platter. In three separate small bowls, toss the potatoes, radishes and cucumber slices with the remaining dressing. 5. Top the arugula with the potatoes, green beans, radishes, cucumber, hard-boiled eggs and olives.